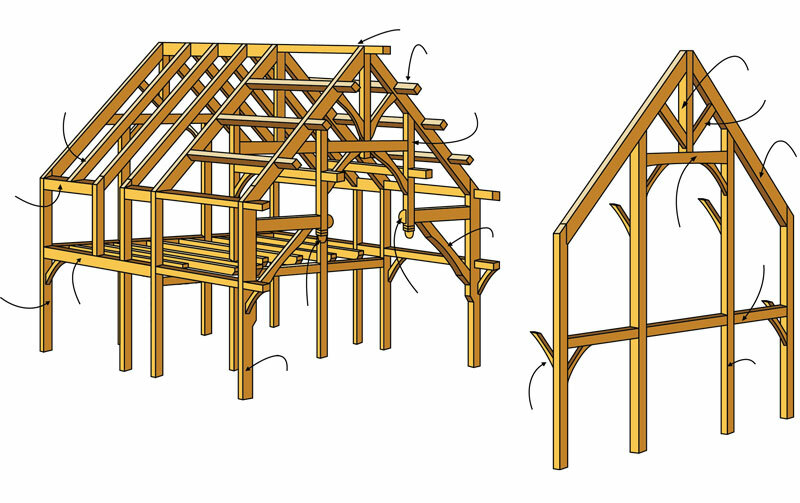 Here's your crash course in timber framing. We cover everything you need to know about how modern design meets traditional craftsmanship in today’s timber frames. Timber homes are versatile and — because you can use any exterior material on a timber frame — can look good in any setting. A timber home is a kind of house that uses a frame structure of large posts and beams that are joined with pegs or by other types of decorative joinery. Almost always, the walls of the structure are positioned on the outside of the timber frame, leaving the timbers exposed for visual effect. Timber framing is strong, old and so well-established that they used to just call it building. It forms the basis of a building that will last for hundreds of years. One of the big advantages of timber-frame construction is that it is so strong it doesn’t need load-bearing walls cutting through the middle of the house, so you can design the layout in any configuration you want, including a totally open great room/dining room/kitchen/entry. On the other hand, in open designs, the frame connects the volumes and brings them down to a more human scale due to the warmth of the wood and the joinery. The skeleton of timbers also can be covered any way you want, so your timber home can look like any other style of house and can fit in anywhere. 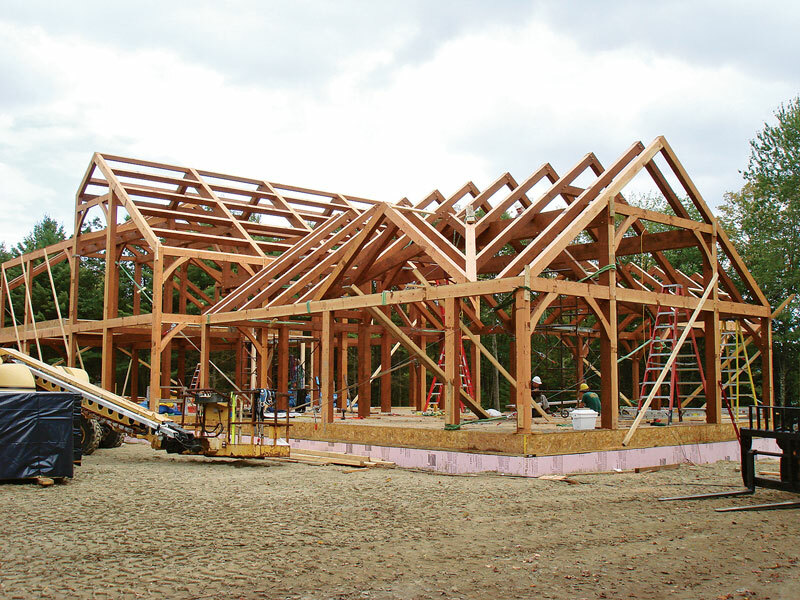 Timber homes are sturdy and strong, but the frames are raised quickly. How are Log & Timber Homes Different? Timber frames are often confused with, but are quite different from log homes. The main distinction between log homes and timber homes is how they use the wood. As a result, they achieve sharply different looks. And because timber homes can use a variety of exterior materials having nothing to do with the inside, they may not be recognizable as timber frame homes, whereas log homes are always identified as such. In general, log homes have a horizontal profile and timber homes are vertical. These tendencies result from the way to logs are laid and the frame is raised. 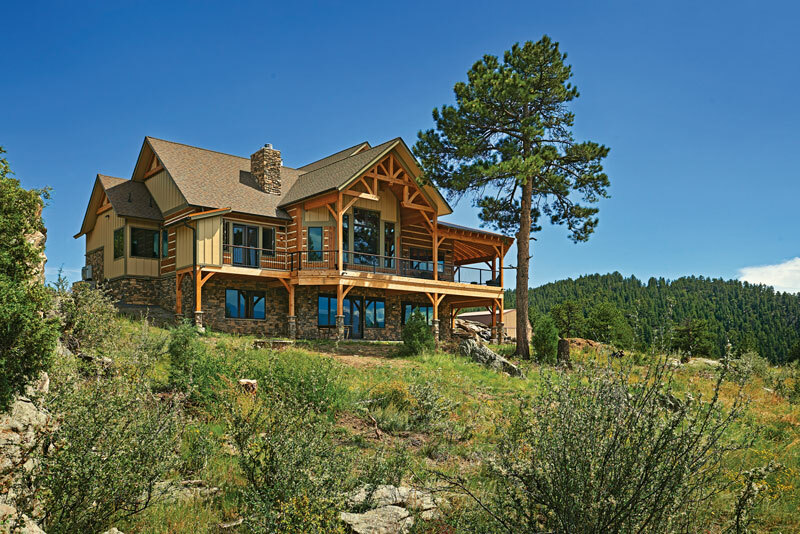 See more about how timber-frame homes are built in the Build section. Beyond the aesthetics of exposed timber and open floor plans, timber structures enjoy a durability unmatched by conventionally-built homes. They also provide more structural integrity in the unfortunate event of fire damage, as the large timber supports are more resistant to burning completely through than the thinner cuts of wood that make up conventional building structures. Finally, a timber home affords the owner opportunity to make a bold design statement, as timbers come in a number of sizes, shapes and colors. 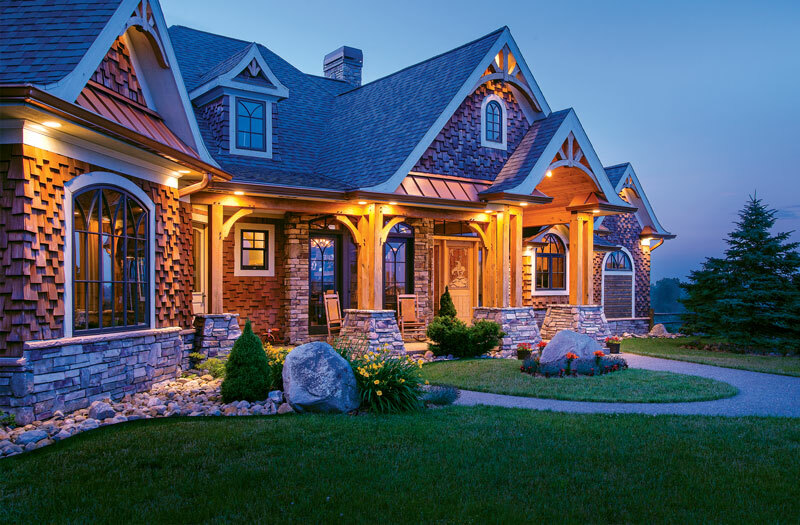 A timber home can take on a casual or rustic mountain style, an ornate Victorian style, the more restrained feel of a classic New England home, or any style in between. Many people are now opting to incorporate logs and other materials into timber homes. Like most specialized art forms, timber framing has a language all its own, with terms for the various tools, materials and construction methods. Below is a brief list of commonly-used timber frame terms to help you better understand the process. Timbers are the wooden beams that comprise the home’s structural frame. Posts are the main upright timbers that comprise the timber frame. Crossbeams connect the post beams, providing stability. Joints are where two timbers or frame pieces come together. Joints can range from simple to highly decorative and include lap joints, mortise-and-tenon joints, dovetailed and pegged joints, among many others. A truss is a rigid triangle of timbers. Trusses provide column-free floor space and are typically incorporated on the top floor. Hybrid is a type of building that combines the methods of timber framing and conventional stud-frame building or, in our industry, log construction. Combining building styles can sometimes save you money and will definitely add visual interest to a home. 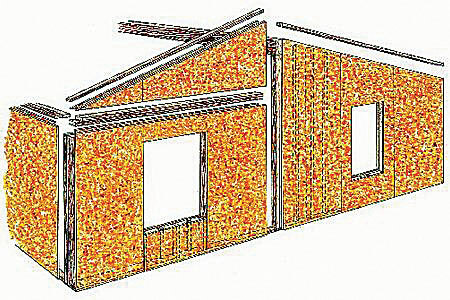 SIPs (structural insulated panels) sheath the timber-frame structure. Made of two layers of durable, flat wood and filled with a highly dense insulating foam in between, SIPs have more or less revolutionized the timber frame building process. Timber homes are complete structures made of vertical posts and horizontal beams to form cross sections called bents. Other members provide support, bracing and structure to the frame. The most common members are shown in the illustration below. They’re flexible. SIPs can arrive at the home site in bundles of large generic panels that builders cut to fit the home’s specific floor plan. Or panels can be cut exactly to the home’s design at the factory by the manufacturer and then numbered for easy installation, which results in less wasted materials and resources. They’re energy efficient. SIPs cut heating and cooling costs by as much as 60 percent over products used for conventional “stick” construction. Even where wall thickness is the same, SIPs outperform stick framing on whole-wall energy performance by 40 to 60 percent. They’re soundproof. SIPs block sound like few other materials — a big perk, especially in bedrooms, dens, home offices and media rooms. For more information, visit sips.org.